As you walk in the streets of Ramallah, with its aesthetically appealing buildings and the chaos of shoppers and street vendors the silence here is deafening. We continue to protract this bubble deeper into the echelons of denial and complacency. The ululations in the summer for Gaza, and the metamorphosis into a population of cheerleaders continues to etch its indentation. We offered blistered tongues and Gaza offered its soul. We echoed and chanted, Ramallah and the international community went out holding “vigils” for Gaza. It held a few flags as the bombs fell left and right. We placed the cause on the rooftops of buildings and now they lay flat. Gaza continues to suffer the consequences of this summer and our muffled disgruntle. The ululations and speeches ceased the moment Gaza didn’t fit our embellished aesthetic of resistance in the form of armed fighters and burnt buildings. 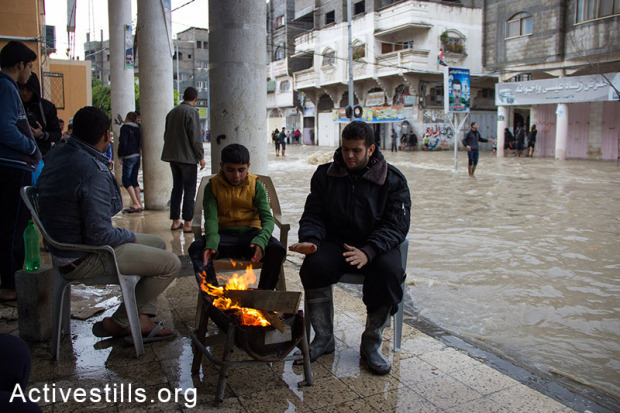 Gaza is still under siege and it is in a state of emergency as it floods not only from water but our hollow and insincere support. It continues to struggle and fight, not in the revolutionary form that appeases our conscious, but in a more existential manifestation. We’ve proclaimed that Gaza is not its own sovereign state ad infinitum. Contrastively, it has been acting exactly as such. With no support, it fought as it continues to fight this horrendous colonialism single-handedly. Our words were a fraction of what we can offer, and even that has come to a halt. Remember those posters of “we are all Gaza?” No. We were never all Gaza, and we universalized their struggle without offering actual assistance, mobilization or aid. Gaza, is not the Palestinian cause. Palestine is the cause, and we refused to act as such, rather we fixated on a fragment whilst simultaneously providing the colonizer more leeway to place a majority of its efforts on that fraction, allowing its colonial macabre to be more brutal. Divide-and-conquer is not just a phrase, it is an applied colonial strategy and we continue to fall to the subterfuge. Gaza ought to cut itself off and truly become its own state. We have failed it de novo unabashed. Remember those mock die-ins? The vigils? The demonstrations we saw at the corner of your flawless selfies? Let Gaza burn it all for warmth. Our shortcomings cannot be glossed and rationalized under false pretexts. It is sickening that we erupt in euphoria when resistance fits our Hollywood representation. This continued struggle, this population that continues to live despite the trauma, those that have chosen to live, and continue to deal with the destroyed infrastructure, that too is resistance. Concurrently, if Gaza cannot mobilize, that doesn’t justify our ineptitude to continue placing pressure and mobilizing ourselves. Our silence, will be reincarnated when this morbidity passes and our failures catch up to us, and then perhaps Gaza will ululate in support of us…maybe. Posted on December 5, 2014, in Middle East and tagged Palestine. Bookmark the permalink. 1 Comment.